Loadliftandshift the manual handling specialist. Our 560mm tread width range has platform height from 750mm - 4000mm in colour Red. Capacity 150kg, available in 4 treads Rubber, Punched , Anti-slip and aluminium. Handlock anchorage when locked the feet rest firmly on the floor. 10 treads and above are supplied in 2 halves for transport purposes. 3 Tread Leverlock Warehouse Step with Anti-Slip Treads Welded steel tube and bar construction. Ha..
3 Tread Leverlock Warehouse Step with Punched Treads Welded steel tube and bar construction. Hand..
3 Tread Leverlock Warehouse Step with Rubber Treads Welded steel tube and bar construction. 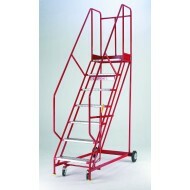 Handl..
3 Tread Leverlock Warehouse Step with Aluminium Treads Welded steel tube and bar construction. Ha..
4 Tread Leverlock Warehouse Step with Anti-Slip Treads Welded steel tube and bar construction. Ha..
4 Tread Leverlock Warehouse Step with Punched Treads Welded steel tube and bar construction. Hand..
4 Tread Leverlock Warehouse Step with Rubber Treads Welded steel tube and bar construction. Handl..
4 Tread Leverlock Warehouse Step with Aluminium Treads Welded steel tube and bar construction. Ha..
5 Tread Leverlock Warehouse Step with Anti-Slip Treads Welded steel tube and bar construction. Ha..
5 Tread Leverlock Warehouse Step with Punched Treads Welded steel tube and bar construction. Hand..
5 Tread Leverlock Warehouse Step with Rubber Treads Welded steel tube and bar construction. Handl..
5 Tread Leverlock Warehouse Step with Aluminium Treads Welded steel tube and bar construction. Ha..
6 Tread Leverlock Warehouse Step with Anti-Slip Treads Welded steel tube and bar construction. Ha..
6 Tread Leverlock Warehouse Step with Punched Treads Welded steel tube and bar construction. Hand..
6 Tread Leverlock Warehouse Step with Rubber Treads Welded steel tube and bar construction. Handl..